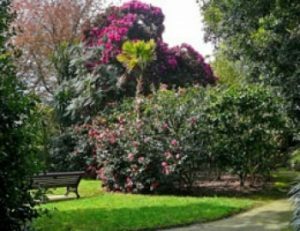 The sub-tropical garden, populated with many varieties of exotic plant: rhododendrons, camellias, giant trees, ferns, magnolias; is a beautiful but now familiar landscape in Cornwall. To anybody viewing such plants, whether in public gardens or simply growing by the roadside, it is easy to forget that they have not always been native to this country. The popularity of species such as these, and a zeal for importing them, began in earnest in the late 18th and early 19th centuries. As part of a wider movement in British science to assemble and catalogue the world’s resources, explorers travelled to far-flung places in search of exotic plants to add to the nation’s collection. Places such as the Royal Botanical Gardens of Kew, with state patronage and impressive premises, tend to dominate histories of horticulture around this time. Yet far away from the metropolitan centre of London were other, smaller locations similarly affected by Britain’s expanding parameters. In addition to plant hunting ‘celebrities’ such as Sir Joseph Banks, there was also a culture of the ‘gentlemanly amateur’, whose desire to collect and categorise fitted well with the new opportunities for exploration opened up by an expanding British Empire. One of the main communications links in the network of empire was the Cornish town of Falmouth, home to the Packet Service that delivered Britain’s mail to colonies and foreign outposts around the world. As a busy port, Falmouth also played host to East India Company trading ships, naval vessels, and many private merchants. On one date in December 1847, local businessman Alfred Fox observed in his journal that there were 190 vessels in the bay . While vast green spaces and the onslaught of industry might seem naturally opposed, horticulture and mining are, in fact, intrinsically linked. It is no coincidence that the Cornish families with mining interests, and consequently great mining prosperity, were the ones to create vast new gardens filled with exotic imported plants. The gardens of Trevarno, Trengwainton, Tehidy, Scorrier, Glendurgan and Trebah, to name only a few, were all at one time possessed by families with mining interests. With so many like-minded people in Cornwall, there was great demand for a society in which they could share their finds and horticultural successes. In 1832, the Royal Horticultural Society of Cornwall was created, with John Vivian Esq., a member of the local gentry and partner in the Cornish Copper Company, being made its Chairman. Other investors in Cornwall’s mining revolution were the Fox family of Falmouth. The name of Fox is one that occurs regularly in the history of the town, as family members also had interests in maritime industries. The family company, G. C. Fox & Sons, was a major ship agent. In addition to this, because Falmouth was such a busy thoroughfare for traders and travellers, family members acted as consul to countries such as the United States. With many homes between them in and around the town, the family created a cluster of several highly impressive sub-tropical gardens. Their success in establishing these gardens can be attributed to two main factors. The first was the mild climate of the area; Cornwall being particularly well suited for exotic species, and Falmouth even more so. Imports were more likely to survive in gardens around Falmouth than in most other locations in Britain. The second, and most definitive, factor in the success of the Fox gardens was the family’s business connections in Falmouth and across the globe. One unique specimen still found at Penjerrick to this day is a brain coral, which can have a lifespan of several hundreds of years. This creature – not a plant at all, in fact – was given to Robert Were Fox by Captain FitzRoy of Charles Darwin’s expedition ship HMS Beagle, when the ship and its crew landed in Falmouth in 1836. Captain FitzRoy visited the Foxes for tea on 3 October, as recorded in the diary of Robert Were Fox’s daughter, Caroline. Being a man of science, interested in much more besides horticulture, Fox had invented a ‘dipping needle deflector’ for navigation at sea, and FitzRoy was, according to Caroline, ‘highly delighted’ with it. The captain also spent time sharing with the family some of the details of his voyage, and the discoveries that Darwin had made. We owe the establishment of this fine plant to Captain SUTTON, of His Majesty’s Packet Establishment, at Falmouth, who informs us that he found it growing in a wood, on a sloping hill, near the Bay of Bomviago, Rio de Janeiro, at an elevation of between 30 and 40 feet above the level of the sea, and not exceeding 40 yards from the water. Its beautiful flowers attracted his attention, and induced him to dig up the plant and bring it home. On his arrival in England, in March, 1833, he presented the choice collection of Orchideous, and other interesting plants he had found, to Sir Charles Lemon, Bart. M.P., and George Croker Fox Esq. Grove Hill, Falmouth, in whose garden the present plant flowered. While the Packet ships were a useful vehicle for importing plants because of their frequent voyages overseas, other companies were equally keen to become part of the plant hunting quest. During a meeting of the Horticultural Society in July 1835, George Croker Fox was congratulated on his acquisition of ‘some choice exotics’ sent to him by Captain Jenkins of the East India Company. In May 1841, a further reference is made to Captain Jenkins supplying the Horticultural Society with seeds; in this instance Camellia sinensis, tea plants, from Assam. Though some imports may have become established more successfully than others, without maritime links between the Fox family and companies such as this, the gardens of Falmouth would almost certainly not have become the sub-tropical paradises that they did. While exotic plants were very much in vogue during the 1800s, and many people liked to collect specimens, the Fox gardens were recognised in their own time as remarkable. An edition of The English Annual, dated 1836, featured as its title page image an engraving of Grove Hill. Inside the book, alongside poetry and prose by popular writers of the day such as Mary Shelley and Mary Russell Mitford, was an article about Grove Hill and the town of Falmouth. In this instance, the town was made worthy of the notice of the reading public not because of its mail service or trading interests, but through its picturesque gardens. Travellers to and from the empire did not assist the Fox family only by transporting specimens; their networks of maritime contacts also provided information on how best to care for them. In 1835, Captain Robert Gillies of the Hibernia, a ship travelling between Falmouth and India, wrote a letter to George Croker and Robert Were Fox, describing – in answer to a request by them – how best to transport delicate specimens on long voyages. The suggested method was to place each plant in a box filled with very moist clay, and to then place this box inside a larger, glass-lidded and hermetically sealed, box. Using this method, plants could be transported back to Britain on voyages lasting five months without perishing. During their lifetimes, Fox family members such as Robert Were, Alfred, and George Croker Fox, successfully utilised their contacts in the maritime world to create extensive estates – places like Trebah, Glendurgan, Penjerrick and Rosehill – that remain appreciated for their horticulture today. In doing so, not only did their reach stretch far across the globe to discover more about unknown and uncharted terrain, but it also drew disparate elements of the empire home. In small, domestic spaces in Britain there live side by side segments of the once-wild landscapes of Asia, Australia, Europe, America and Africa. Ultimately, the links made through the port of Falmouth enabled the Foxes to create a microcosm of empire; a world’s garden in one space that did truly fit the Fox ideal of ‘a small ‘peace’ of heaven on earth’.